Today, as a food journalist and cookbook author, I continue to devour books, newspapers, and magazines as if my life depends on it. I regularly read about food trends, culture and history, and I study recipes from around the world — in German, Greek, English, French, and Italian. I also draw inspiration from my own huge and ever expanding cookbook collection. But with the advent of all things digital my glorious cookbooks rarely leave their shelves anymore. Instead, after an initial burst of joy, they turn into static tomes. They sit quietly and un-used in their allocated spots, decorating the dining room and my office—despite the culinary treasures they contain. Say I want to roast a whole fish in a salt crust for dinner guests. Where on earth did I see the recipe last fall? In which of my gazillion books? By which author? As I hurriedly pull out tome after tome, I soon find myself frustrated and abandon the query. Overwhelmed and crushed for time, I turn to the Internet, hoping it will come close to what I was looking for. Last year, my vast cookbook collection was, as if by magic, unlocked—and a universe opened up. All my beautiful books have come alive, literally. 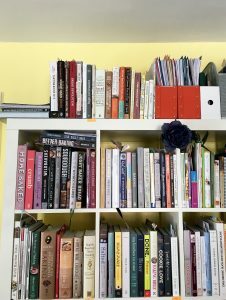 Without physically lifting a tome, I can now search the content of my cookbooks on my computer or iPhone. Without pulling a tome off the shelf, I can digitally search my whole library—by ingredient, by season, by holiday, nutrition, ethnicity, author, and so much more. How? With the help of Eat Your Books, a brilliant data base that has indexed almost 7,000 cookbooks and 1.5 million recipes. You simply scan the barcodes of your books with the help of a cheap scanner or an app—and voila, all your books are now searchable for their recipes and ingredient lists. I’m double lucky because I had the help of Jane Kelly who lives and works in the Boston area and showed up at my doorstep with her own scanning tool. Jane is the creator of Eat Your Books. Full disclosure: I have known Jane for years after meeting her during a food conference. I have also been interviewed on her site and received a lifetime member during a promotion. But, swallowed up by writing and promoting my own two cookbooks, I never found the time to actually scan my collection. So scanning we did together one afternoon last year, and I hope I baked some whole-grain treats in exchange. And, because you come here for recipes too, I’m sharing a savory-sweet creation you can make all through spring and summer. Juicy and refreshing, it is inspired by the bright flavors of a tropical salsa and pairs well with grilled steak, pan-fried salmon, or just enjoy as is. The recipe can easily be doubled or quadrupled for a party. Incidentally, this is the first salad creation of mine without olive oil. In fact, it has no oil at all. Admittedly this felt strange to someone who puts olive oil in and on everything. I even drizzle it on German whole grain rye bread. But, in this case, tasting and testing it side by side, I was surprised that I enjoyed the simple spicy citrus dressing without oil the most. Back to Eat Your Books which has since changed my life. This is what I wrote on Facebook after Jane’s visit: “I almost cried, seriously…after all, my books sit here with me on my book shelves. But I had no idea how many wonderful recipes they contain”! Indeed, I now know that I have 50 (!) recipes using whole fish, and, even more important, from cookbook authors I trust. So go, book lovers, sign up and re-discover your printed cookbook collection in a whole new way. And tell me if you like the farro salad. 1 Add the cooked grain to a medium bowl, followed by the pineapple, onion, cucumber, 2 tablespoons of the cilantro, and the jalapeno. 2 In a small bowl, whisk together the lime juice, honey, salt, and cayenne. Taste and adjust sweetness and heat, adding more jalapeno and cayenne if you like. Extra salt is typically not needed as the cheese can be salty. 3 Drizzle the dressing over the ingredients and toss to combine. Allow to sit at room temperature for 15 minutes or so for flavors to meld. When ready to serve, top with the ricotta salata and garnish with remaining 2 tablespoons cilantro. The salad can be prepared a few hours ahead. Cover and chill. Leftovers are great for the lunch box. I always recommend soaking whole grain farro overnight; it becomes easier to digest and cooks up more evenly. There is no need to soak widely available semi-pearled farro, typically imported from Italy. Of course, this salad tastes best when your pineapple is at peak flavor. I have learned from my Greek mom that scent is a great indicator of ripeness in fruits. She always smells her tomatoes, and I now smell everything at markets too, including pineapples. I find scent a much better indicator than many of the other great tricks I have read about pineapples, e.g. pulling leaves out of the crown, etc. So buy the fruit only if the bottom omits a heavenly fruity scent and if the skin is largely yellow (not mostly green). 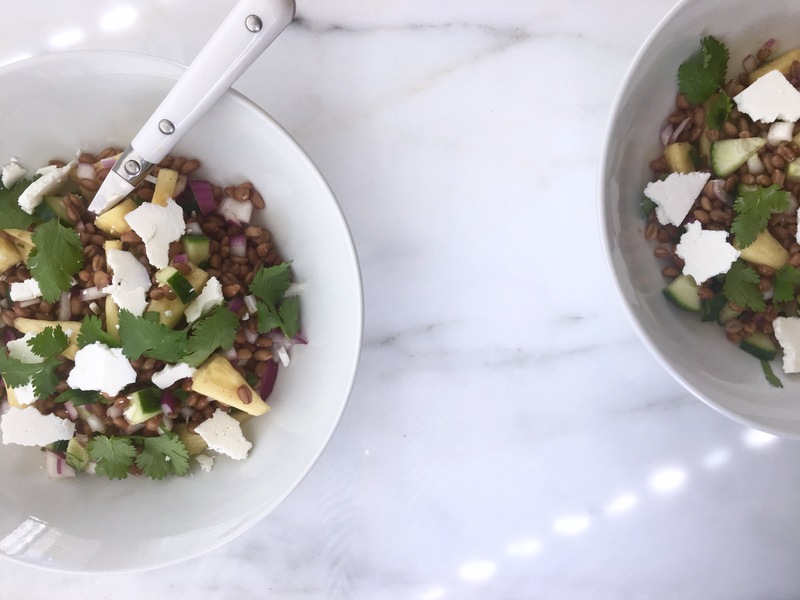 Among my favorite farro sources are Hayden Flour Mills, Bluebird Grain Farms, Kandarian Organic Farms, as well as from grains visionary Anson Mills. But today, there are many more excellent grain growers in the US and Canada. I recently ordered Kandarian’s farro for the first time and detected the scent of lilies (!). Seriously good. So be sure to click on Local Grains on my site where I list many sources. And if you want to better understand why locally grown grains taste so good and why they matter, here is a link to an article I recently wrote for the new sister publication of Edible Boston, the magazine To Market.